Today, I'm bringing a delicious side dish to your Christmas or New Year's Eve dinner. A warm and creamy winter mushroom gratin flavored with lemon, rosemary, thyme and Parmesan cheese. We love mushrooms but my usual method of cooking them is a simple saute. This recipe definitely raises the bar! The recipe is based on one I found in a cookbook that I recently won from fellow blogger, Pam, of Pam's Midwest Kitchen Korner. She had offered the book as a giveaway to celebrate her blog's 6th anniversary and I was the lucky winner! Thank you again, Pam! 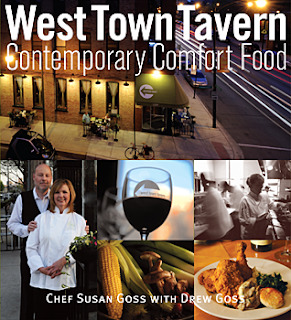 The cookbook is called West Town Tavern: Contemporary Country Food with recipes from the popular former Chicago restaurant of the same name. Unfortunately for us Midwesterners, the owners, Susan Goss and Drew Goss have relocated to New Orleans and the restaurant has closed. At least we have their cookbook which is filled with wonderful recipes! 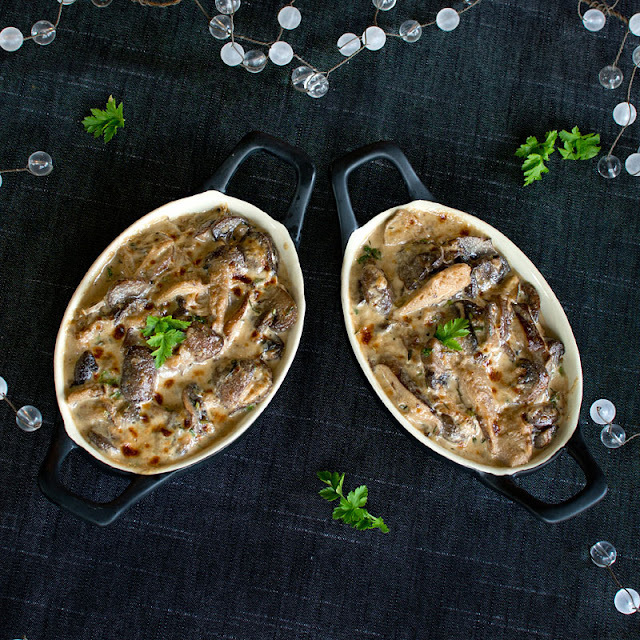 It was so hard deciding which recipe to make first but I'm so glad I started with this mushroom gratin because it was so packed with wonderful flavors that I can see myself making it over and over again this winter. It would be delicious as a side to almost any type of meat, or, just add a simple salad and it could be a delightful meatless meal for two. We enjoyed it with Garlic Buttered King Crab Legs. Oh, and did I mention you can make this a day ahead? Time saver alert! I hope you are enjoying the many lights and decorations of the season! Trim the mushrooms and slice or chop thickly, discarding stems of woody mushrooms as shiitake. You can leave little mushrooms whole. In a 5-quart saute pan, heat the olive oil until almost smoking over medium heat. Add the shallots and saute until golden, about 2 minutes. Add the garlic and mushrooms, cover the pan and let the mushrooms simmer until they have given up their juices, about 10 minutes. Uncover the pan and raise the heat to high. Continue to saute the mushrooms, stirring, until the pan is dry and then add the Sherry. Stir until the mushrooms absorb the Sherry, then add the cream and salt and pepper to taste. Bring the cream to a boil and reduce the heat to medium-low and simmer until the cream has thickened, about 3 or 4 minutes. Stir in the grated cheese, lemon zest and herbs and remove from heat. Adjust seasonings, if necessary. Divide the mushrooms and sauce mixture among 6 small ramekins or use gratin dishes. At this point they can be covered and refrigerated overnight. If serving right away, preheat the broiler to high. Place the ramekins or gratins on a baking sheet and broil until bubbling and golden on top, about 30 seconds, watching carefully. Serve immediately. If the mushroom mixture has been made ahead and is cold, preheat the oven to 350F, uncover ramekins and bake until the gratins are warmed and bubbling. Then turn on the broiler and broil them until golden brown on the top as above. Note: The original recipe calls for orange zest and pecorino romano cheese. You won't believe this..well yes you will..I just just made a very similar dish for J and I this week,,from Pol Martin..served on/in hollowed out crusty bread..3 of us..C J and I adore mushrooms.. I believe it :). The crusty bread and mushrooms sounds wonderful! Great looking dish for us mushroom lovers. What beautiful gratin Susan!! I love mushrooms!!!! Sounds delish. Love the mix of mushrooms and the little gratin dish. The hint of Sherry is wonderful in this too. Thank you, Madonna! Mine has a temperature dial that goes down to 110 degrees so it works perfectly as a slow cooker. Thank you, Lynn! I hope the Viking loves it, Dom! Thank you! This would be a great side dish for my hubby's venison. Thanks for sharing. The dish looks so tempting! I would love to try this out. I love mushrooms! Thank you, Kanak, and thanks so much for your sweet comment. This is so very delicious! I love that it can be prepared ahead...just the right one for the holidays. Thanks for sharing, Susan. We all need do ahead ideas for the holidays since we're already overloaded with things to do :) Thank you, Angie! This will be perfect to serve with the beef tenderloin I plan to serve for Christmas. It would be a perfect side for beef tenderloin. If you have mushroom loves I would definitely double the recipe. Thank you, Linda! This looks delicious, but how many mushrooms are to be used? 1-1/2? Pounds, presumably? Thank you for bringing that to my attention, Pattie. Yes, 1-1/2 lbs and I've corrected that now. It is delicious! I can't wait to make it again. Thank you, Carolyn! Merry Christmas to you! Oh my - definitely a dish I could eat as a main course. Thanks for sharing the recipe. Me too :) Thank you, Glenda! Thank you so much for sharing this. We love mushrooms and yes, just end up sauteing them. This will be placed at the top of our list...hopefully will try it soon. I hope you love it as much as we did, Susan! Thank you! This is something I would like to try. Mushrooms are really high on my list of foods I can't live without...they add so much to any meal, from breakfast to dinner. Thanks for sharing, Susan. It's so good, Marigene! Merry Christmas to you also! This is an extra special recipe and I would serve it with grilled ribeyes, our California Christmas tradition. 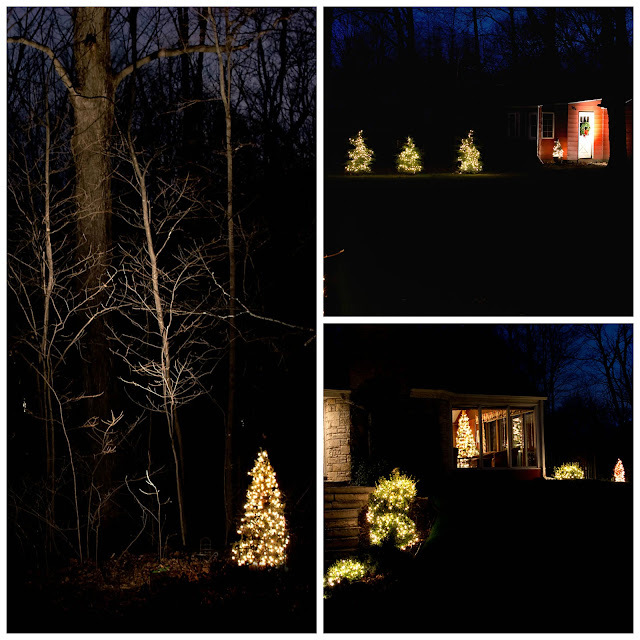 Your lights are beautiful too Susan. Have a merry, merry Christmas! It would be perfect with grilled ribeyes, Renee. I loved the fact that I could make them earlier in the day and then pop them in the oven to heat and broil. Unfortunately the mushrooms are not welcome in my house, my son hates them .... But I love them, I will make a small baking dish just for me! Beautiful photos full of Christmas atmosphere Susan, I wish you and your family a peaceful Christmas, a warm hug! Nothing but deliciousness in that dish, Susan. I love all those flavors and mushrooms are my favorite. We every spring in my youth foraging for morels. This is the kind of dish I could eat for supper with a glass of wine. Hope I have the opportunity to try this over the holidays! I'm going to make Ina's mushroom and leek bread pudding for Christmas, as it will go well with stone crabs, everyone's choice this year! Oh my I love stone crabs dipped in creamy mustard aioli! The mushroom pudding you're making sounds wonderful too. Thank you, Barbara! You get all ooooohhhhs and aaaaaawwwwwws from me for this recipe! Thank you so much! I can't get enough mushrooms. Hope you have a very wonderful Merry Christmas! Thank you, Tricia! Merry Christmas to you and yours also. Thank you, Rebecca! Merry Christmas to you and your family also. Thank you Chris! It is a great recipe. Your gratin sounds absolutely yummy. It would be wonderful as an accompaniment to roast beef. 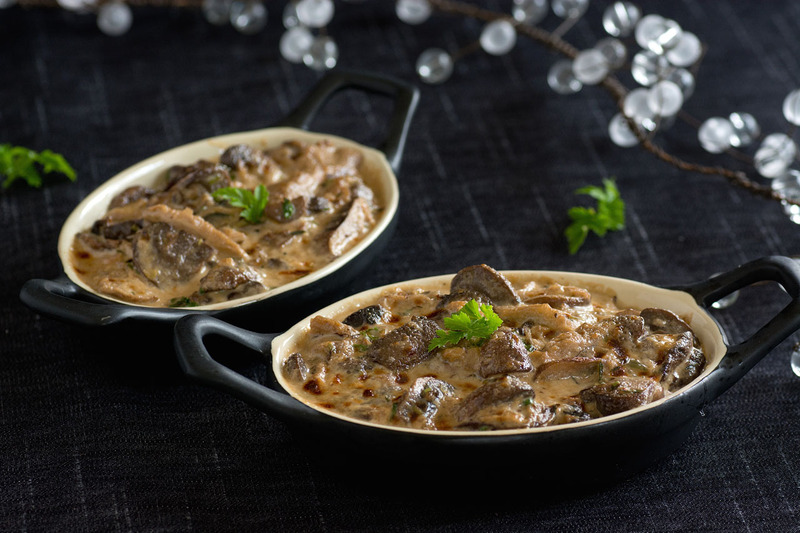 This mushroom gratin sounds and looks delicious, creamy and rich...it sure it perfect for a cold winter day. This looks so good! A perfect side dish with a winter dinner. Hope you have a wonderful Christmas!!! This recipe sounds like one of those winning repeat 'keepers'! I could eat mushrooms plain, I love them just that much! I know my husband wouldn't touch one mushroom unless he was forced to, so I'd just be able to enjoy this all by myself. Thank you for sharing this recipe and congrats on winning this great cookbook! Mercy! Sorry I missed this! I just saw it in your side bar. I love mushrooms and will be trying the recipe. Glad you like the cookbook, Susan! I often wondered why you never commented :) Glad you finally saw it, Pam, and thank you again!